The aim of the General Defense Committee (GDC) shall be to provide defense and solidarity to members of the working class under attack. We provide these through the provision and maintenance of legal and financial support, and through attempts to innovate new forms of defense of the working class as a whole. The GDC promotes the vision of the IWW and the creation of worker-run industry to the entire working class. Effective worker organizations will face oppression from the master class, and have been effectively shut down and marginalized through lawsuits, imprisonment, and through the institution of neighborhood terror by police and security. Some attacks on worker organization involve courts, police, and prisons. We must secure defense against such attacks, but do not imagine that legal and financial defense alone are sufficient. Some of the most effective weapons of the master class are to divide the working class according to unevenly shared cultural, social and systemic oppressions of the working class. 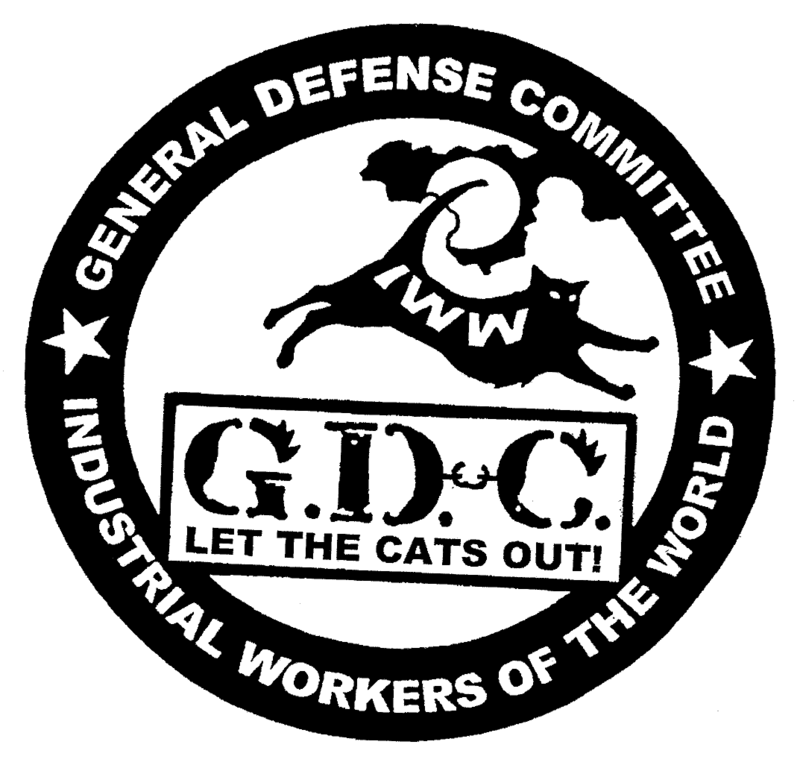 While the IWW organizes against such divisions in the workplace, the GDC both defends workers in legal trouble, and takes action against such oppressions, in ways that attempt to strategically link anti-oppression struggles to worker organization. As such, we see the GDC’s mission partly as defense of active organized workers already in our union, and partly as outreach to currently under-represented members of the working class. It shall be the purpose of the General Defense Committee to aid those who find themselves persecuted by the powers that be in their struggle for justice and freedom. It shall also be the purpose of the General Defense Committee to publish and distribute literature exposing the false and reactionary propaganda of the master class. By organizing the many and centralizing their efforts in each instance, labor will be given the protection of the entire working class, thereby making an injury to one the concern of all. The name of this Local of the General Defense Committee of the IWW shall be Twin Cities Local 14 (also referred to as Local 14). Membership shall be by voluntary association of GDC members in good standing. These bylaws shall be made available to every Local member as soon as possible upon initiation. Members are subject to all constitutional provisions set forth in the GDC bylaws as well as the IWW Constitution and bylaws when applicable. ‘Good Standing’ in the GDC Local 14, Twin Cities, is defined as having paid up through one quarter prior to the current quarter. The local shall elect a First Local Secretary, Treasurer, and Delegate Coordinator (First LST Team); a Second Local Secretary, Treasurer, and Delegate Coordinator (Second LST Team); and Delegates. The Local may create and elect any other officers by proposal and vote, and each additional officer shall be subject to the provisions of this article. Working Group chairs are not necessarily officers of the local. Working Group chairs are not necessarily officers of the local. The First and Second Local Secretaries, Local Treasurers, and Local Delegate Coordinators will be elected to 16 month terms, and will process through the positions as follows. CYCLE: The local will elect a Second Local Secretary, Treasurer, and Delegate Coordinator every year, at the same time as currently held elections. The Second Local Secretary, Treasurer, and Delegate Coordinator will spend four (4) months as First Local Secretary, Treasurer, and Delegate Coordinator receiving training and mentoring in the role from the First LST Team, who are ultimately responsible for administrative work of their respective LST Team positions. After four months, the Second Local Secretary, Treasurer, and Delegate Coordinator automatically become the First Local Secretary, Treasurer, and Delegate Coordinator (respectively). The old LST Team’s terms are now finished. Should a Local Secretary, Local Treasurer, or Local Delegate Coordinator leave the position before the end of the term, the corresponding member of the Second LST Team immediately becomes a member of the First LST Team in their elected role, and a replacement for the remainder of the Second LST officer’s term is elected at the immediately subsequent business meeting. Elections for local officer positions will be held annually. Elections will be conducted by regular vote at a regular scheduled Local meeting. Elections will be announced at the Local meeting two months prior to the election and at the Local meeting one month prior to the election. This announcement will be included in the minutes of those meetings. Announcements will also be sent over the listserv by the Local Secretary one month prior to the election. Eligible voters shall include all members in good standing of Local 14. Voter eligibility is determined by the records of the LST Team. Members in good standing who are not able to attend the business meeting when the election is to be held shall have the right to vote by proxy for any eligible candidate, provided they give their vote in writing on paper, by email, or by fax to the LST Team the day before the election. Any member in good standing can nominate any other member, including one’s self, to Local officer positions at any business meeting. Nominations do not require a second. All members nominated who accept their nominations shall be considered in the election. All officers of the Local must be members of both the GDC and IWW in good standing. Delegates shall be elected on an annual basis and serve 13 months from the date of their election. The final month of their term shall therefore follow the election of their successors. During this month they will continue as authorized officers of the Local, with the primary duty to train in their replacements. However, consecutive terms will not be allowed for the positions of Local Secretary, Local Treasurer, and Local Delegate Coordinator. The First and Second Local Secretaries, Treasurers, and Delegate Coordinators shall serve 1 year terms, as outlined in section III.2. Unfilled positions may be assigned to willing volunteers at a regular scheduled Local meeting. Special elections, referenda, ratifications, and recall elections may be called for by any eligible voter willing to give proper notice to all eligible voters. All elected roles are accountable to the membership and subject to its guidance, democratically decided instructions, and progressive discipline up to and including recall. A Local Secretary, who shall call the monthly business meeting, be the primary administrator for the local listserv, and maintain minutes from meetings and all other Local records not maintained by the Local Treasurer. A Local Treasurer, who shall maintain membership records, maintain local finances, pay bills, serve as the primary check signer for the Local’s bank account(s), and produce and submit finance reports to the Local and GDC central. A Local Delegate Coordinator, who shall serve as the super-delegate for all delegates and coordinate delegate meetings. All three members of the Local Secretary-Treasurer team shall serve as Local liaisons to GDC Central and have access to the Local’s email account. Further duties shall be split up among the members of the Local Secretary-Treasurer Team by mutual agreement. Delegates shall sign up new members, take dues, maintain regular contact with members and other fellow workers and attends scheduled delegates meetings. They shall listen for and, when appropriate, help solve problems, sometimes by means of a grievance process, sometimes by more informal means. Delegates shall submits reports and dues to the Local Secretary quarterly. As many delegates are elected as needed (preferably one delegate per 5-10 members). Attends monthly meetings of the Local whenever possible as well as all special meetings. Twin Cities Local 14 meetings are to be held monthly. Rusty’s Rules of Order shall be used to organize decision-making. Meetings must be publicized to members at least by email and when necessary by face to face contact and telephone. Not less than five members shall constitute a quorum for the transaction of business by the Local and its recognized committee(s). The transaction of business includes official motions and the disbursement of local funds. Any business raised at a meeting with fewer than five members may be submitted to the Local listserv for a vote by any member in good standing. Any votes taken on the listserv must comply to the following practices. The complete motion will be posted to the listserv by the Local Secretary, at the request of the moving member along with the number of members in good standing at the time. The Local Secretary shall have no discretion to refuse to send motions from members in good standing to the list. The Local Secretary will, in the same email, announce that the time-frame for votes to be sent over the email list, and specify the date and time when voting is closed. This time frame is not to be less than 48 Hours, and not more than 1 week (7 days). If more than 50% of members in good standing vote yes or no before the vote ends it automatically passes or fails. Ongoing campaign work within the GDC is to be carried out by Working Groups. A working group is struck by a vote of the Local at a monthly business meeting. Working groups may be ‘closed’ to new members on a temporary basis near the beginning of its existence, for the purpose of clarifying goals. analysis, and perspective, and composing a mission statement. Working groups may be closed for security reasons, or temporarily in order to discuss mission statements, et cetera. Working groups shall elect their own chairs, who must be GDC members in good standing, but need not be IWW members. Working groups shall submit written reports to the GDC Local’s monthly business meetings; three missed reports will result in an automatic vote at the subsequent business meeting to consider dissolving the working group. Working groups shall designate an Internal Communications person, whose responsibility is to report to the rest of the GDC membership about Working Group activities, answer questions, and coordinate discussions between the Working Group and other members. Working groups shall approve a mission statement within the first two months of their existence, which mission statement includes a specific radical perspective on the working group’s subject matter. Dues payments, voluntary donations, and assessments are welcome and must be accounted for, as must any other funds. Local accounts shall be available for inspection and audit by any Local member within one week of request. The fiscal year of the Local shall run from July 1st to June 30th. In July there shall be an audit and report of the Local treasury for the previous fiscal year. Three members of the Local and/or Twin Cities General Membership GDC of the IWW shall conduct the audit. All statements are expected to conform to the Constitution and Bylaws of the IWW and all relevant Local and international Bylaws of the GDC. Statements from the entire Twin Cities GDC may be approved at a Local business meeting. Statements may also be approved over the listserv via Article V Meetings Section 5 of the Local Bylaws. Statements may also be authored by any chartered Working Group of the Twin Cities GDC. They shall be signed as a statement of the particular Working Group of the Twin Cities GDC. Working Group Statements must be approved by a meeting of the Working Group that achieves quorum (5 members in good standing). Statements may also be approved via a majority vote of Working Group members in good standing over the Working Group listserv or a majority of votes cast within 24 hours. Approved statements along with meeting minutes or email correspondence shall be submitted to the Local Secretary Treasurer prior to publishing. Any change to the bylaws must be proposed at a regular monthly business meeting. Such changes are automatically tabled until the next regularly scheduled monthly business meeting, at which point the proposals can be passed by a simple majority of Local members in good standing.